After reading such rave reviews of it in Nags' blog,I HAD to try this cake.I was sold on the name itself,now come on,doesn't the name of the cake itself make you crave for it?I toyed with the idea of trying the cake out soon,but then I had a better idea.How about making it when I lay my hands on the book itself,from which the recipe was born,sounds better isn't it.Again,after reading Nags' review on MMKT.I completely agree with all the good things,and I also agree with her point that this book has too many Yeast bakes too,something you generally do not associate with a Baking book. Now which book are we talking about.Yes,it is Marcy Goldman's book A Passion for Baking,I own it now,don't you remember? I set about making it,and I had planned to follow the recipe to the T,but as usual,made some minor changes which definitely did not hinder the taste of the cake and in fact,I felt it only improved the final product.I have added the changes I made in brackets. Grease a 9' springform cake pan or a regular pan and line the bottom as well as the sides. In a saucepan, simmer dates in water and vanilla until they are soft and almost mushy (about 5 minutes). Remove from heat and stir in baking soda. The mixture will foam a bit. Mix well and set aside to cool completely. In a bowl, cream butter with both sugars and orange zest until fluffy***. Blend in eggs and then fold in flour, baking powder and salt. Then add the dates and mix until well combined. Pour the batter into the prepared cake pan and bake for 35-40 minutes or until done and a skewer inserted into the cake comes out clean. Bring brown sugar, cream and butter to a gentle boil and let simmer for 5-7 mins until the mixture thickens. Remove from fire and stir in vanilla. Set aside. Once the cake is done, when its still warm, poke holes with a skewer and pour the sauce over, allowing the cake to absorb it. Serve slightly warm or at room temperature. *Since I used white sugar for the cake,the cake lacks the Golden color.But let me assure you,the taste is not one bit compromised. **I used white sugar for the toffee sauce too hence followed a different method to achieve the golden color. In a thick bottomed sauce pan,add the sugar and heat until it starts caramelizing.When it starts bubbling,add the butter and stir well. Now add the cream and stir until everything comes together. ***Following Dorie Greenspan's method,I rubbed the Orange zest into the sugar until the sugar was moist and fragrant and then added it into the butter for creaming.This method ensures perfect distribution of zest throughout and along with the flavor of Dates,the Orangey taste stands out too. Wait for the cake to cool down a bit before cutting to get neat slices[in short,don't be like me! ].Another tip is to refrigerate the cake for a while until it starts setting a bit and then cut it to get pretty slices. Incidentally,this is my 400th post on Easycooking,a great achivement for someone who thought she'll run out of recipes after the 25th post!A BIG thanks to all of you who encouraged and appreciated my efforts throughout.I will keep my Thank you speech short as this post has become longer than I thought.Wait for my next post which is going to be extra special with an event and a Giveaway too...stay tuned!! On a completely different note,my recipe of Palak Pathrodo was featured in Vanitha[March 1-14] edition and I am so happy about it.Just thought I'd share the excitement with you! OH my I absolutely love it Divya.. so moist.. hot toffee sauce.. seriously drooling. Congrats on your 400th post, Divya! :)..wishing you many many more hundreds to come!! You wont believe this divya, I have bookmarked this long ago ever since sis got me a pack of brown sugar and wanted me very much to try it out!..the cream, the dates and the sugar are still sitting lazily here and there in the kitchen! 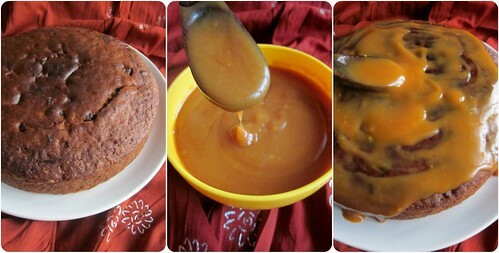 Absolute yummy cake Divya,I have tasted this from Nags in one of our blogger meets,I loved the toffee sauce very much! Congrats on your 400th post,way to go! Double congratulations to you. 400 posts is a huge milestone dear. Wish you many more such milestones to achieve. The toffee sauce is so very inviting that I just wanna lick the sauce away. I made your palak pathrado on Sunday and loved every bite of it. Was missing out on pathrado for a long long time due to unavailability of taro leaves. Thanks so much for this recipe. I'm so glad it was featured in Vanitha. Very well deserved. nags made this yummy one during our blogger meet.This looks awesome and i love the way u have presented this. congrats on ur 400th post dear..cake looks really droolworthy..I wish I could take a bite of it..
looks lovely..really look forward to your cake posts..yumm..
Congrats Divya on reaching such a big milestone.the cake looks so delicious. What a sinful delight to celebrate your feats, Divya. Best wishes for many more to come. Still waiting for your Ernakulam update! Great Cake for the Celebration! Congrats on ur 400th post Divya, wat a beautiful cake to celebrate this special post, hot toffee sauce makes me drool..
Super super yummy. And indeed how else can one celebrate than with one yummy cake. Congrats Divya! May you have many many more! Even I love Marcy Goldman's recipes! Congrats on 400 posts! Woo hoo -and I have to hunt for your recipe in vanitha, my mom subscribes to it here.I've amde this cake numerous times from Nag's blog - love it too! Congrats.....and a lovely way to celebrate!! 400 posts! That's amazing! Congratulations! Congrats on your 400th post, certainly extremley commendable for someone who thought will run out of posts after the 25th:-)And your recipe fetaured in vanitha too, double celebration! 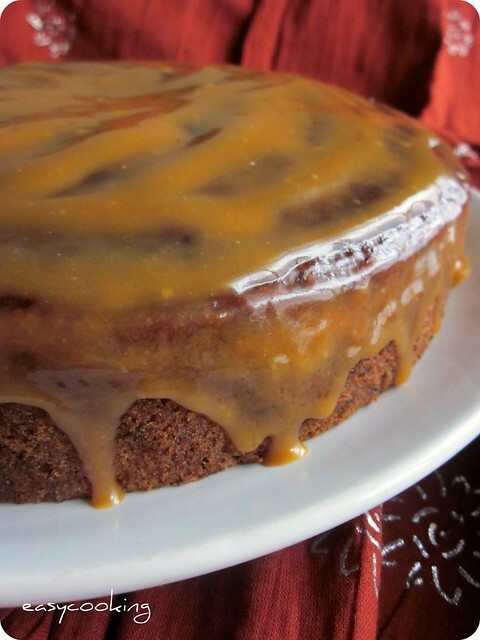 The cake certainly looks seriously yumm,smothered with the toffee sauce. Now u re-inspire me to bake this one! WOw..hey congrats not only on ur 400th post..guess what..visited a frnd 4 days back, saw this cover of Vanitha and asked her if she was back in movies now..:) Wd ask her to go through it! :) AM truly proud about this achievement! Featuring on mags..wow! :) Hugs. CONGRATS on the 400th post. Saw your recipe in Vanitha.Actually saw ur pic first then the recipe.Looks Great and I too love pathrodo. I have tried with collard greens but never palak. The toffee cake is great and I think I too must go for that book. I've drooled at this plenty on Nags' space! Now drooling here. I've got to make this soon now. Love the pictures! Ooh Divya, that cake looks amazing. Congrats on 400 posts, that's a lot for 3 years!! i hope i get a reply for this! i want to make this cake without the sauce. 1 1/4 cups sugar will be nuff to sweeten the 2 cups maida batter? i know the sweetness of dates is considered. am so tempted to add much more crystal orange zest that i made at home. and the white choc ganache stowed away in my freezer. a wise choice? what do you think is the difference between using whipping cream and normal amul fresh cream? 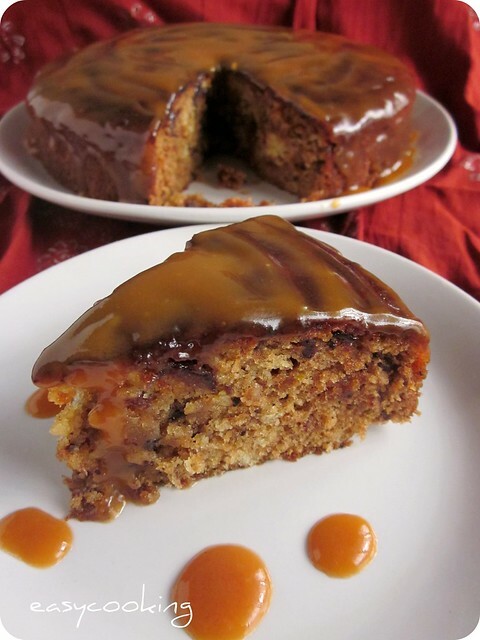 The cake tastes better with the toffee sauce,I haven't tried making it plain so cannot give you an opinion on that.Yes you guessed it,the sweetness of the dates along with the mentioned sugar makes the cake sweet.There is the toffee sauce too,so it is all balanced.You can add more Orange zest,but we are highlighting the flavor of dates here,so you do not actually want to over power that with orange.White ganache is not actually a wise choice in my opinion. Amul cream has 25% fat whereas whipping cream has 36%(I think),in short whipping cream has more fat content which helps in getting it whipped faster.Amul cream has to be whipped along with some melted butter to achieve that texture.